AAA Fire Protection Services is dedicated to providing the best in fire protection products for your Saratoga kitchen or commercial facility. We supply and install the best in fire protection and fire suppression equipment including fire extinguishers and cabinets, complete sprinkler system design and installation, kitchen fire suppression systems, industrial fire safety systems, grease exhaust cleaning services, commercial grease filter exchange and much more. 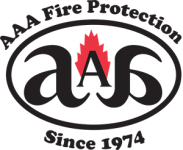 AAA Fire Protection Services prides itself on the trustworthiness and reliability of its professional, technical staff. Our techs are always learning and improving and we are up-to-date on the latest in fire protection technology for your Saratoga, California business. Our business has lasted more 35 years because we never forgot our important mission. We serve commercial enterprises throughout Saratoga with the finest products and the most dependable services in the field of fire protection and fire suppression. We are family-owned with the utmost dedication to the well-being of our valued Saratoga clients.